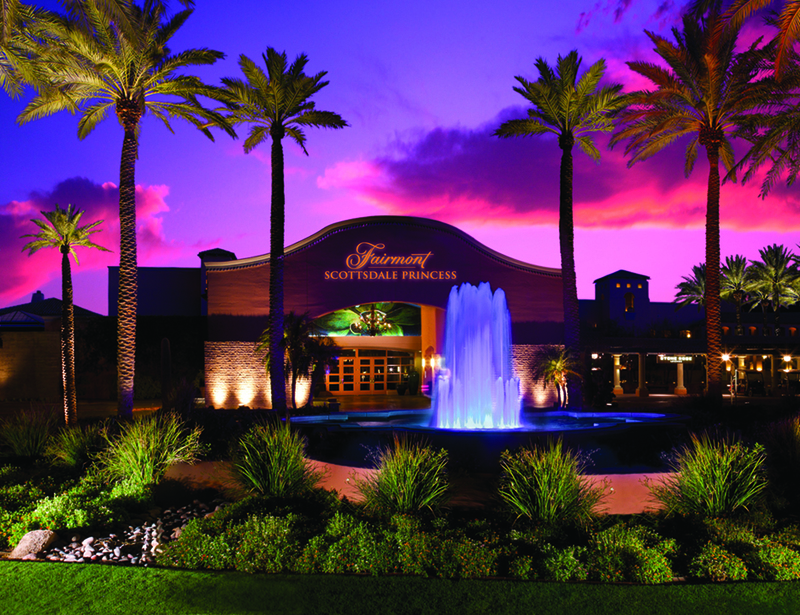 The Fairmont Scottsdale Princess Resort in Arizona is famous for many things, from its world-renowned TPC golf course to the Southwestern-chic AAA Five Diamond accommodations that it offers. While many venture to this revered resort to stay and play, others come just for the fine fare as there are multiple excellent eateries on-site. My personal favorite is La Hacienda Restaurant by Richard Sandoval where modern interpretations of classic Mexican cuisine reigns supreme. Those fortunate enough to dine here quickly learn why La Hacienda has adopted the slogan “Old Ways, New Hands.” This upscale restaurant takes the traditional staples of Mexican fare and fuses them with the very latest cooking techniques and presentation styles inspired by the finest kitchens in Europe. Rather than focusing on bulk, spice and heat typical of South of the Border-based eateries, the more refined menu at La Hacienda instead focuses on fresh ingredients, surprising food pairings and lighter dishes that let the top-quality ingredients and skill of the culinary team shine though. To ensure patrons receive a premium epicurean experience, the Fairmont Scottsdale Princess Resort teamed up with Richard Sandoval to create La Hacienda. A Mexico native, Chef Sandoval trained at the Culinary Institute of America and owns over a dozen restaurants across the world. He is rightly considered the father of modern Mexican cuisine. La Hacienda represents the zenith of his life’s work, as he takes Mexican food to compelling new heights. Commanding the kitchen each night is the resort’s own Executive Chef, Forest Hamrick, who led La Hacienda to receive the AAA Four-Diamond award for three consecutive years. What can you expect when you dine at the La Hacienda Mexican restaurant in Scottsdale? The first thing you’ll notice is the décor. While the food is urbane, the restaurant is warm and casual, befitting its resort location. You’ll feel at home within the traditional Spanish architecture with wood beamed ceilings, beautiful stone floors, stone fireplace, and ornamental iron elements throughout. Both indoor and outdoor seating is available and, in both, the atmosphere is lively and inviting. Just like the food to follow, you’ll find the modern alongside the traditional, starting with the supremely stylish Tequila bar. Indeed, La Hacienda is a true tequila lover’s paradise. There are over 200 varieties of the spirit available, made by 36 different producers from across Mexico. At nightly artisan tastings, and even tableside with the resident tequila sommelier, patrons learn how to appreciate the subtle differences between the types and flavors, educating and titillating their palate with the finest blanco, reposado and Anejo tequila available. 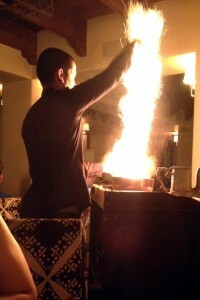 For something delightfully different, try La Hacienda’s famous flaming creamed tequila-laden coffee concocted tableside in all of its fiery glory. It’s a spectacle and taste sensation that you’ll never forget. Once you’ve warmed up nicely with a tasty tequila or a margarita, it’s time to move on to the food itself. You’ll find all of the Mexican favorites that you love, but many have a vibrant modern twist that elevates them to a sophisticated new level. For starters, there is a wide choice of guacamoles or antajitos (“little cravings”). The guacamole, made tableside, is fresh and authentic—the sampler is an especially good option as it offers three uniquely flavored versions: pomegranate, spicy crab, and pepita. There’s a very wide selection of taquiera available but, whichever you choose, you can be sure that it will be bursting with taste, and prepared and presented to perfection. There are tacos based around a variety of tasty proteins, including fresh Maine lobster, skirt steak, beef brisket, green chile chicken, slow roasted pork shoulder and barbacoa, each with its own set of components. This variety is representative of the menu on the whole, as every dish at La Hacienda is as exciting as it is expertly executed. The menu goes on to offer admirable versions of other Mexican food favorites like enchiladas, fajitas, soups and salads. The Enchiladas de Mariscos, for example, combines blue lump crab, shrimp, Mexican oaxaca cheese and a chile arbol cream sauce to produce a flavor sensation that’s powerful and sublime. It’s the bold entrée selections I feel really set this restaurant apart from the pack. Some of the standouts include Costilla de Res with braised beef short rib, vegetable escabeche, crema fresca potato and chile-guava sauce; Grilled Ancho Lamb Spareribs with chipotle bbq, cucumber mint salad and corn on the cob; Wild Isles Sea Trout with grilled sustainable steelhead trout, quinoa a la Mexicana, poblano cream and oven-dried heirloom tomatoes; and Camarones Adobado with adobo shrimp, creamy poblano rice, achiote truffle butter sauce and pineapple plantain salsa. Another great example of Chef Sandoval’s fusion approach to Mexican cuisine is the ‘Robalo Tempura’, which is comprised of tempura fried sustainable sea bass with savoy cabbage and a chile arbol remoulade. Here Mexican and Japanese cuisine merges with a French panache to create a taste sensation. Sea Bass is delicate, and it takes real skill to create this dish that delivers on taste without overpowering the delicate flavors of the fish itself. Be sure to pair your entrée with one or more delicious sides, which are just as tasty as the main dishes themselves. My personal favorites are the sweet corn habanero slaw, fried plantains, and the creamy poblano rice, all of which are great accompaniments to any meal here. Whether or not you’re staying at the Fairmont Scottsdale Princess Resort, try to make your way to this haven of fresh, modern Mexican cuisine. One visit to La Hacienda and it becomes clear why the restaurant earned the distinction of being named the number one Mexican Restaurant in Arizona.